We didn’t have to work at the winery on weekends and sometimes our hosts would recommend things for us to do. One day Marcello told us about an event coming up. He described it as a walk – with wine and food. It cost 25 Euro. As a winemaker, he had donated 6 bottles of wine for the event. Would we like to go? Well of course we’d like to go! Wine? Food? Walking?? These are all things that are right up our alley. So, Marcello made a reservation for us. 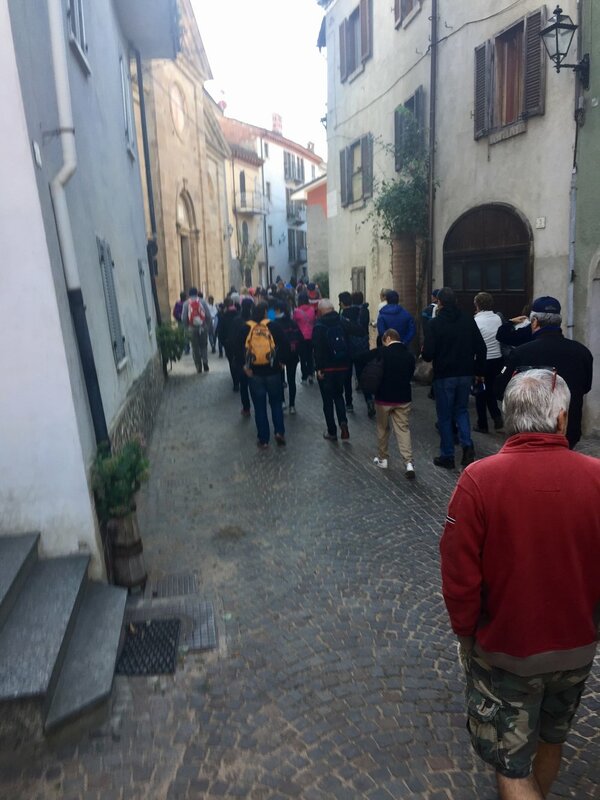 We were told it would be a 9 km walk and the event would start with breakfast and coffee in the Piazza Belvedere in Dogliani at 8:30 on Sunday morning. The “Passeggiando ai confine di Castello” – Walking around the Castle – would begin at 9:00. We got up early and walked the 4 km downhill from the winery to Dogliani. We got there while they were still setting up. I’m pretty sure we stood out like a sore thumb. Using our very best Italian (which is clearly not very good) we said we had reservations. We were handed a bag with a glass in it to put around our necks and Greg got a hat; I got a sort of purse, or bag. I laughed so hard when Greg put that bag around his neck. He looked ridiculous. It was awesome. We talked about the many times we attended the Granbury Wine Walk and how much fun we’ve had there over the years. There was a truck with coffee – tiny little cups of espresso. It was cold outside and let me tell you, it’s quite difficult to warm your hands around a tiny plastic cup! They also served slices of bread with either Nutella, honey or marmalade. We ate slices of bread and drank 3 cups of espresso waiting for everything to get started. We started our walk around 9:40. There were probably 200 people “walking around the castle” on this Sunday morning! There were old people and young people and every age in between. We were the only Americans. There were 2 other foreigners there – from the Netherlands. There were men directing traffic and leading us onward through the vineyards and the fields on our walk. It was incredible! We walked up hill a long way – probably for 35 minutes or so before we stopped for our first antipasti (YES – I said our FIRST antipasti!) Everyone filed through the line and our plates were loaded with carne crudo – raw meat, a typical Piemontese dish. We then went to the wine tent and they filled our glass (as many times as we wanted) with our choice of wine from the Dogliani region – wine donated by the many vinters in the area. 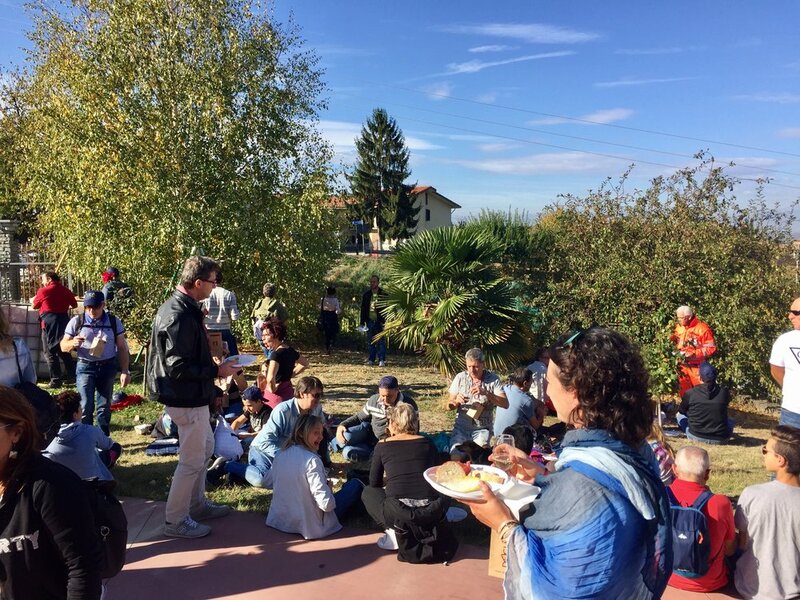 We sat down by a fence, in the winemaker’s yard, with our wine and our raw meat, at 10:15 in the morning, with 200 strangers who mostly didn’t speak English – and relished in the experience. This process repeated itself time and time again. It was amazing!! We walked from place to place – farm to farm – enjoying each course with local wine and dining al fresco. Each host was generous and happy we were all there for the event. 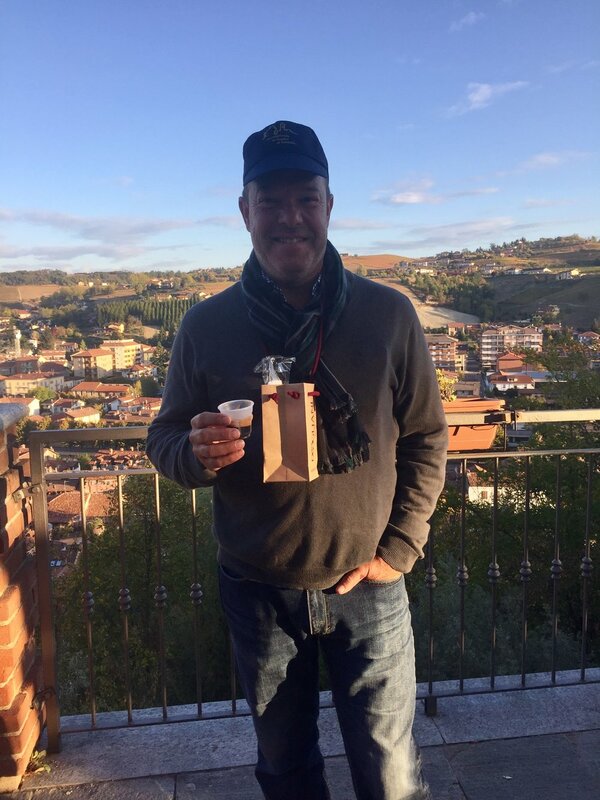 We enjoyed a second antipasta of bagna cauda, then a pasta course with the biggest serving of spaghetti you’ve ever seen – then the secondi or meat course – thinly sliced and roasted beef with carrots…..then a cheese course and then back to the Piazza Belvedere for dolce – the sweet course. When we arrived at one winery we were ushered in and introduced to the winemaker and his sister as “The Americans”. He proceeded to tell us all about a wedding he attended recently in New Jersey and what a nice time he had in the States. They made us feel very special. We wish so much that we had better Italian language skills so we could really communicate but we do our best and have fun as we blunder along. A few people did talk to us along the way. Some folks came up to us and asked if we were “the Americans.” Another couple had their children come up and talk with us so they could practice their English. We walked 9 km with these wonderful people and loved participating in this truly local event. 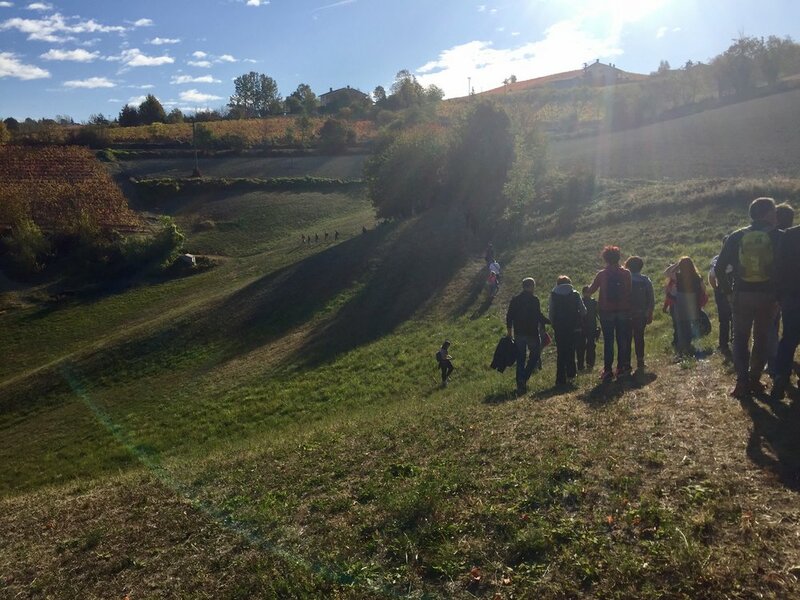 We walked up the steepest vineyard you can imagine and old and young alike happily encouraged each other as we made it to the top of the hill. We finished our experience at 4:00 in the afternoon. As we walked the 4 km uphill back to the winery, we felt very lucky to have been included in this community on this very special day. Please share your email address so that we can let you know each time a new blog is posted.